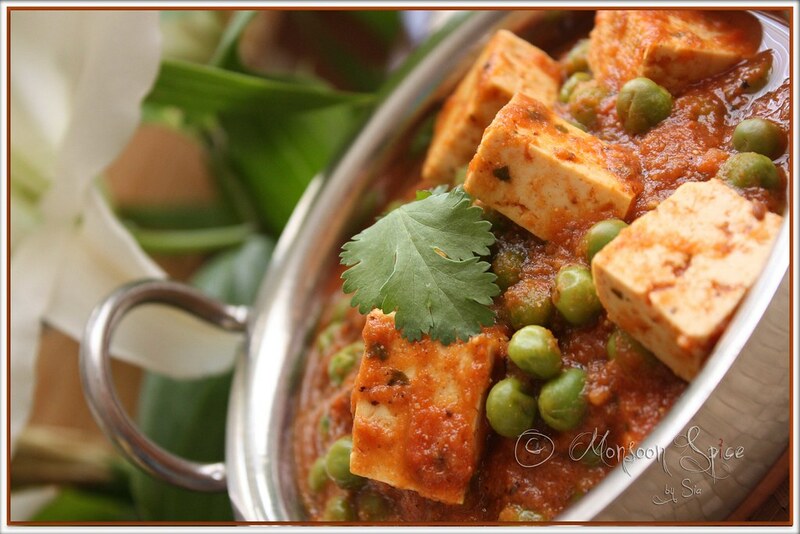 Monsoon Spice | Unveil the Magic of Spices...: Tofu Matar: Why Not Try Something New Today? Tofu Matar: Why Not Try Something New Today? Last week I was here, staying at one of the picturesque places of England. Our little cottage was tucked in between soothing sound of flowing river, breath taking landscape of mountains and miles of green fields. For once we were away from everyday hustle bustle and running around chasing deadlines and never ending word loads and I couldn’t help but feel blessed to be surrounded by Mother Nature in her warm bosom! Grind all the ingredients listed under onion and almond-cashew paste separately, with out adding any water, to smooth paste and keep aside. Heat oil in a pan and add cumin seeds to it. When cumin starts to sizzle and turn golden red, add onion paste. Keep stirring for 6-8 mins till onion paste turns light golden brown and becomes one dry mass. Make sure that you cook this onion paste thoroughly or else the gravy will taste bitter. Mix in sugar and kasuri methi leaves and stir for another minute or two. Next, add pureed tomatoes and mix well. Bring the mixture to gentle boil, about 4-5 mins. Mix in garam masala, kitchen king masala and salt to taste and add about 1-1½ cups of water. Reduce the heat to low and add tofu cubes and green peas and cover the lid. Let it cook undisturbed for 5 mins. Mix in almond and cashew paste and stir well. Increase the heat to medium and let the curry cook uncovered for another 5-7 mins. The gravy will start to thicken at this stage. Adjust the seasoning and add little more water if you prefer little thin gravy. Switch off the flame and squeeze in lime juice. 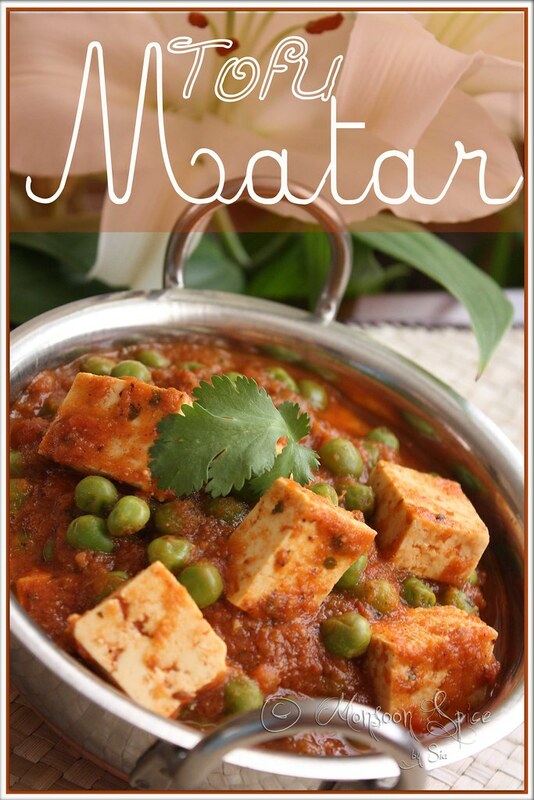 Serve this delicious Tofu Matar garnished with coriander leaves and enjoy! Those who don’t like Tofu can simply substitute it with Paneer. Shallow fry Paneer cubes in little ghee till both the sides turn golden red in colour. Keep them in a bowl of warm water till needed and proceed with the recipe. And if you are not fond of Paneer and Tofu, simply substitute them with boiled, peeled and cubed potatoes. Green peas can be substituted with black or Kabuli channa or chickpeas. Once i tried tofu and i didn't like it, maybe i should try to make this dish with toffu. Nice to know that you had fun :) The dish looks so rich and creamy...healthy toowith the tofu and nuts, love it! 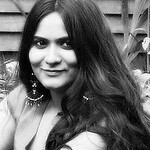 Am a regular visitor to your blog all the recipes are yummy. photos looks great nice presentation. can we paneer instead of tofu? I saw those pictures a couple of days back ...what an awsome place! lucky you!! 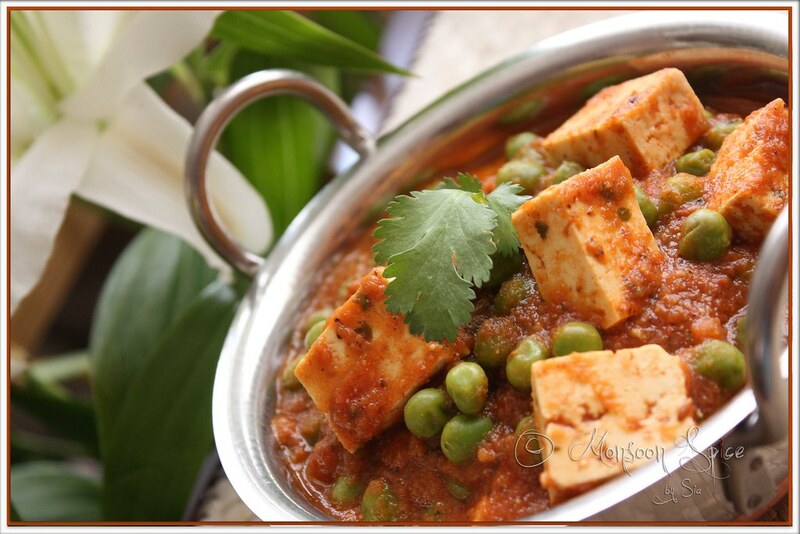 glad u had a peaceful holiday :) and double glad that u r back :)great way to substitue paneer with tofu, loved the almond and cashew usage in the curry, gives the simple thingie an elevation in taste. Lovely snaps as always. Hey Sups! Glad you had a wonderful vacation.... Tofu Matar looks delicious!!! This is more regular at home than matar paneer now! I always toast/fry the tofu before adding onto the gravy. The pic is, as usual, fab, Sia! gotta try this in the weekend. i have all the ingredients - for once! Hi Sia, very glad to hear you throughly enjoyed your stay and had a refreshing break from routine life:-) I love the combination of tofu and matar, and will definitely be trying this.I have never combined almonds and cashew for a paste before, it was either almonds or cashews alone, so this seems more nutty and tastier too. I am so happy to see that the Kasuri methi and the masala are optional! I hardly use paneer these days. Like N, I toast the tofu! This dish of yours can wait- I HAVE to try Rengan revaya 1st!!! Thats a wonderful idea of replacing paneer.. Looks delicious! I like tofu! Glad you had a good time Sia. That place did look like heavenly. I like using tofu in Indian sauces. Love the tofu paired with peas. I tried once but didn't appreciate much the tofu in this way. The pict is tempting! Nice tofu recipe. Sounds and looks so good. Gorgeous picture. YUM! I just made this and it's delicious! Thanks for the lovely, aromatic recipe! @Justine, glad u enjoyed it :) Thanks for letting me know.